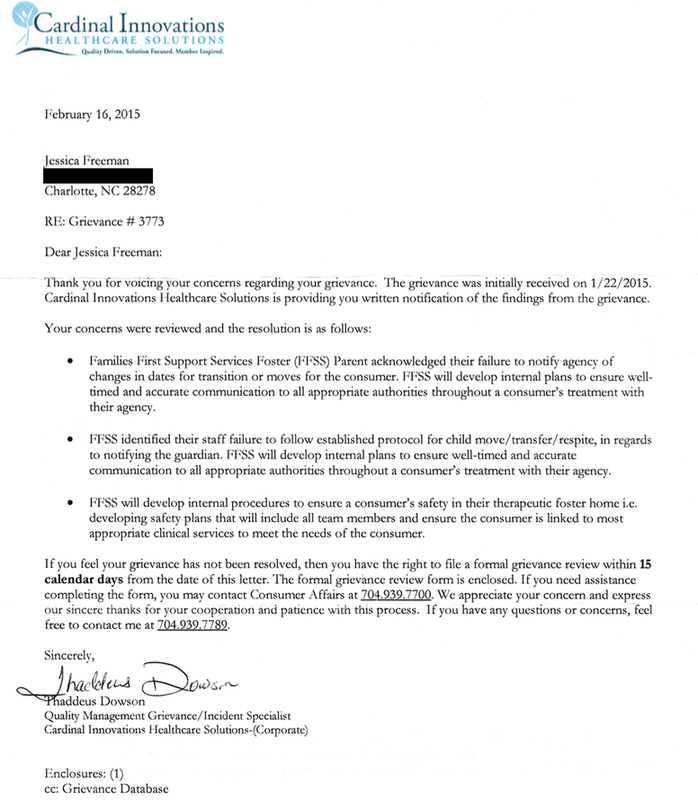 Through hours of blind calling I found out that when a provider does something that you feel fails to meet your child's health care needs you have a right to file a grievance with the insurance company. Because of the many negligence issues with Families First Support Services I filed multiple grievances with Cardinal Innovations. Above is their response. I am saddened to hear that the response is simply that they will continue to work with the provider to improve, especially considering the seriousness of some of the issues related to my daughter's care that were found to be true. It is my hope that by me being more public about the story parents will be able to make an educated decision in the placement of their children who need out of home care, even if Cardinal chooses to continue to use this negligent agency.